Story (from Kalaya's mom, Beverly): "Thinking of the word Spring made Kalaya think of Connecticut's state bird, the Robin, which tried to make a nest on top of our front door wreath every Spring. One year we allowed the Robin to nest there and we enjoyed the upbringing of three baby Robins. It also brought to mind her grandmother's backyard vegetable garden. Kalaya helps her grandmother to pick the many different types of tomatoes during the Summer. While most of Kalaya's free time for the past three-and-a-half years has been devoted to gymnastics, entering the Healthy Lunchtime Challenge is Kalaya's way of making her dream of becoming a chef a reality." Kalaya serves this meal with a fruit smoothie. --Preheat the oven to 350 degrees. --Oil 4 muffin cups and place in a muffin tin pan. --In a small bowl, mix one egg with a fork. Pour the egg into a muffin cup. Repeat with the next three muffin cups. --Place muffin pan in the oven for 4 minutes. --Remove from the oven and add 1/4 of chicken, carrots, sprouts, cilantro, and tomatoes into each egg. --Place muffin pan back into oven and cook for another 15 minutes. --Take out and let cool for 3 minutes; cover to keep warm. --Mix the egg in a bowl with milk and cinnamon. --In a large nonstick skillet, melt the butter on low heat. --Use a flower-shaped cookie cutter to cut 2 flower shapes out of each slice of bread. --Dip and cover the bread flowers in the egg mixture. --Add to the pan and cook for 2 minutes on each side or until golden brown. --Add a halved cherry red tomato in the center of 2 of the French toast flowers and a blueberry in the center of the other 2 French toast flowers. --Cut the apple into spirals or cut around as if peeling to make the bird's nests out of the apple. It will make four small bird's nests. --Top each bird's nest with 3 blueberries. 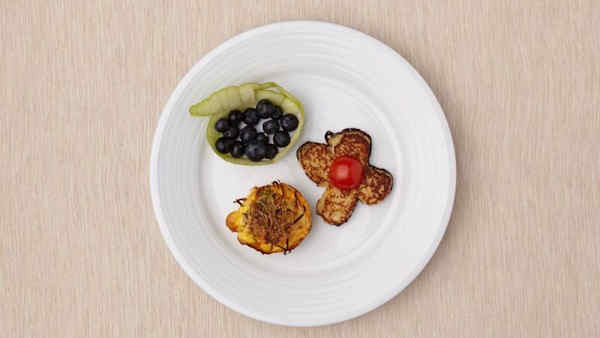 --Serve 1 Egg Bird's Nest, 1 French Toast, and 1 Apple Bird's Nest on each plate.